Star Wars Commander Thire Bust Bank: One of the greatest Clone Commanders in the Empire's history is memorialized as the newest vinyl bust bank from DST! 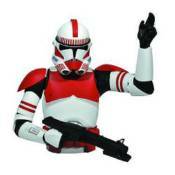 Commander Thire (born CC-4477) commanded the Coruscant Guard, elite shock troopers that defended the capital and hunted down Separatists during the Clone Wars. This 8-inch vinyl bust bank features a detailed sculpt and paint, as well as a coin slot for inserting loose change.